This cheesy dip recipe has all of the fantastic flavor of stuffed mushrooms! It is easy to prepare and serve, especially with a little help for the holidays from Kraft. Try this Stuffed Mushroom Cheesy Dip Recipe for your holiday appetizer. 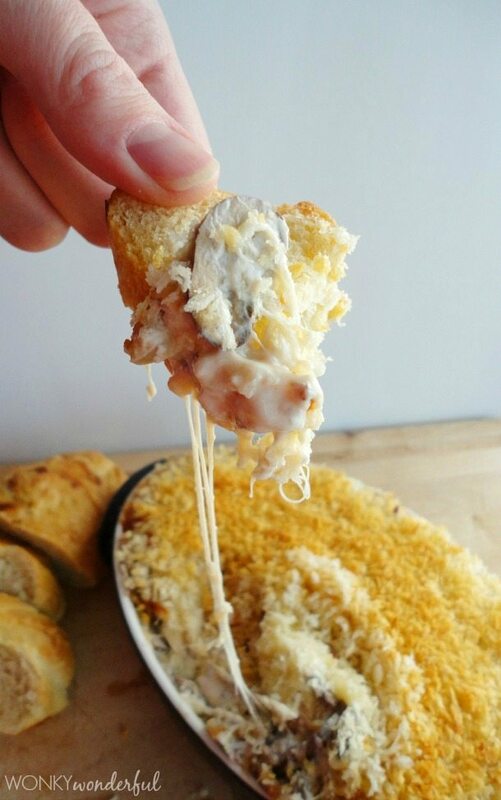 Just look at that ooey, gooey, cheesy, deliciousness! 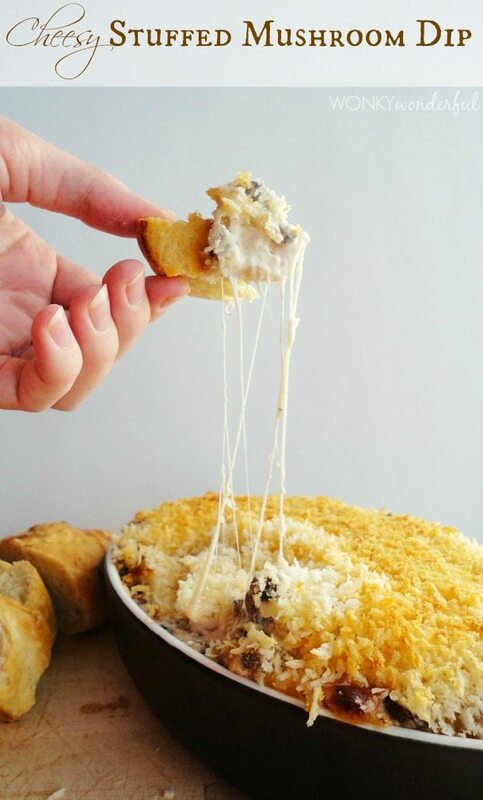 This dip is packed full of melty Kraft Shredded Cheese and mushrooms. 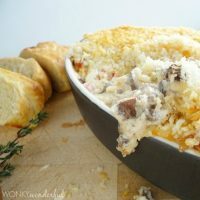 Best of all, this Stuffed Mushroom Cheesy Dip Recipe is super easy. I got a little help from Kraft. Does anyone still shred their own cheese? I don’t . . . I used the Kraft Italian Five Cheese blend. Round up the ingredients and get to chopping. This is the only time consuming part of this recipe. 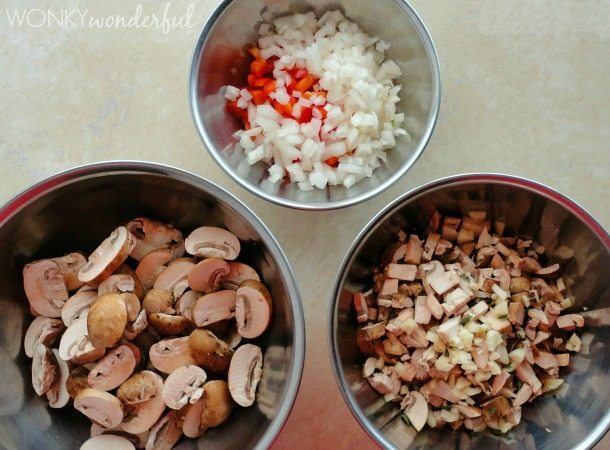 I sliced half of the mushrooms and chopped the rest. Chop the onion, pepper, garlic and sauté. It’s smooth sailing once you are finished chopping and sautéing. 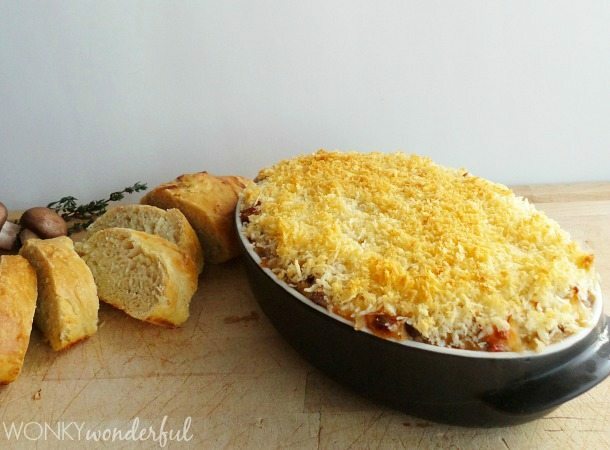 Combine the mushrooms with the cheese mixture, top with bread crumbs then bake! 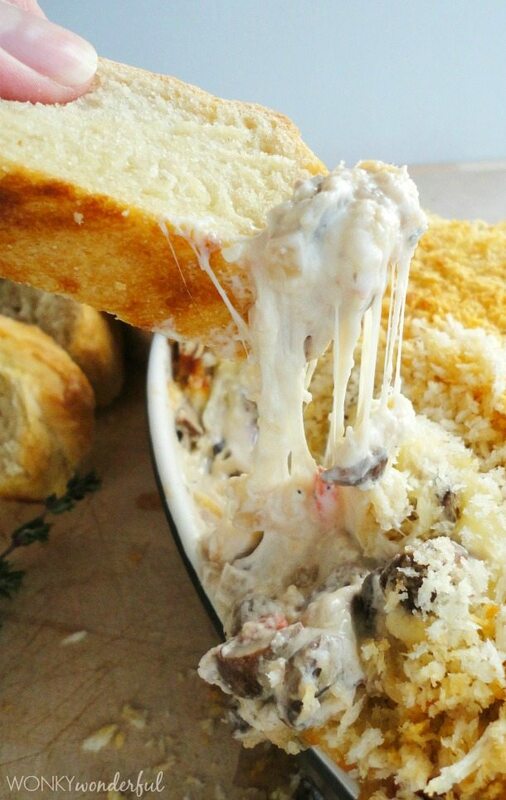 In about a half an hour you can dive right into this Cheesy Stuffed Mushroom Dip! In a large sauté pan over medium heat - sauté the sliced mushrooms in the olive oil for 4 minutes. Stir frequently and gently. Add the chopped onions and red bell pepper. Continue cooking for 3 minutes. Add the chopped mushrooms, garlic and thyme. Cook for 3 more minutes. Remove from heat and let cool while prepping the cheesy mixture. 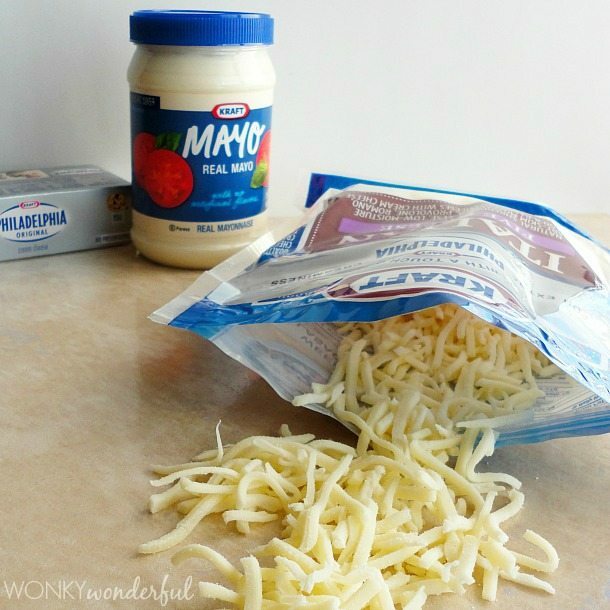 Mix together the cream cheese, Greek yogurt, Kraft Mayo, Kraft Shredded Cheese, salt, pepper and garlic powder. Mix the melted butter and bread crumbs together with a fork until fully coated. 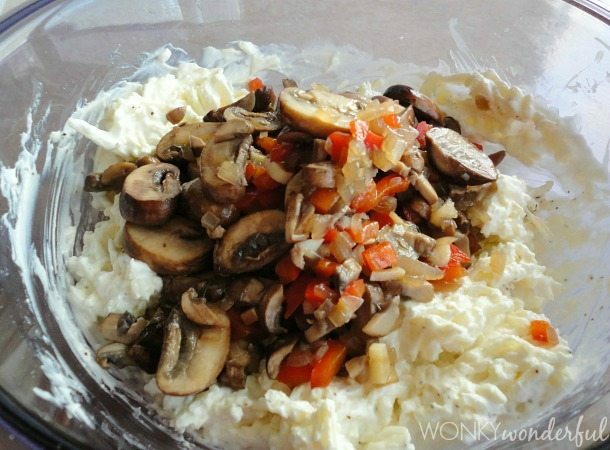 Using a slotted spoon, transfer the mushroom mixture the the cheesy mixture and stir together. Discard the liquid leftover from the sautéd mushrooms. Transfer dip to an oven safe dish and top with the 1/2 cup of Kraft Shredded Cheese. Finish with an even layer of bread crumb topping. Serve hot with crackers or bread. From shopping for gifts to planning family dinners, it’s hard to keep up with all your holiday to-do’s. This year, Kraft is helping out with great weeknight meals and entertaining ideas to make the season a little bit easier.